Felter L., Osborne L., Wooten H., Ricketts G., Marble C., Ali G. UF/IFAS Extension in Orange, Osceola & Seminole Counties, FL. Objectives: There are 900 nurseries in Central Florida representing over 5500 acres. Many nurseries practice calendar spraying for insects and disease control without the use of scouting. This practice wastes time and money. 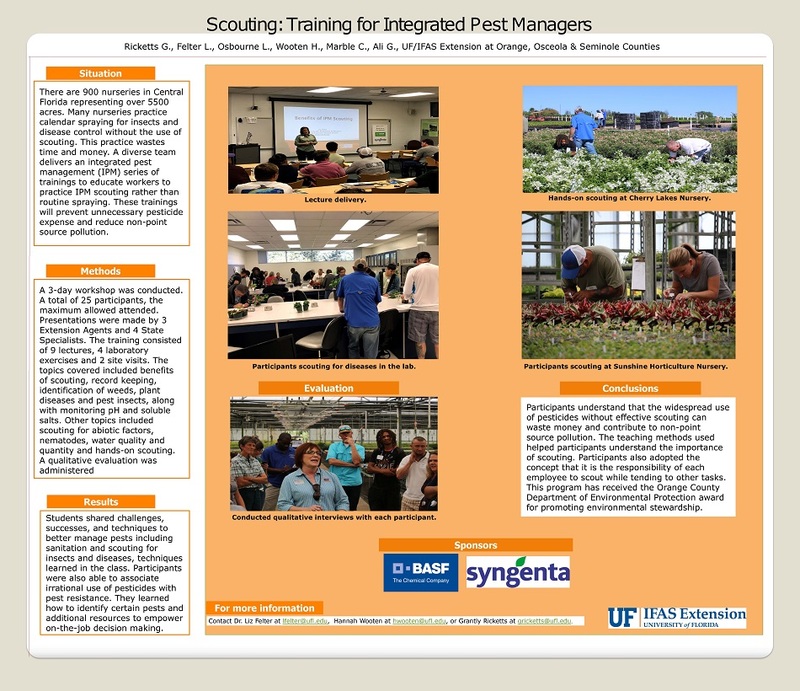 A diverse team delivers an integrated pest management (IPM) series of trainings to educate workers to practice IPM scouting rather than routine spraying. These trainings will prevent unnecessary pesticide expense and reduce non-point source pollution. Methods: A 3-day workshop was conducted. A total of 25 participants, the maximum allowed attended. Presentations were made by 3 Extension Agents and 4 State Specialists. The training consisted of 9 lectures, 4 laboratory exercises and 2 site visits. 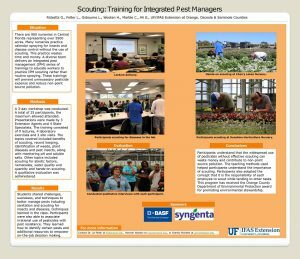 The topics covered included benefits of scouting, record keeping, identification of weeds, plant diseases and pest insects, along with monitoring pH and soluble salts. Other topics included scouting for abiotic factors, nematodes, water quality and quantity and hands-on scouting. A qualitative evaluation was administered. Results: Students shared challenges, successes, and techniques to better manage pests including sanitation and scouting for insects and diseases, techniques learned in the class. Participants were also able to associate irrational use of pesticides with pest resistance. They learned how to identify certain pests and additional resources to empower on-the-job decision making. Conclusion: Participants understand that the widespread use of pesticides without effective scouting can waste money and contribute to non-point source pollution. The teaching methods used helped participants understand the importance of scouting. Participants also adopted the concept that it is the responsibility of each employee to scout while tending to other tasks. This program has received the Orange County Department of Environmental Protection award for promoting environmental stewardship.